a book review by Francis P. Sempa: A Man and His Presidents: The Political Odyssey of William F. Buckley Jr.
". . . a fascinating examination of Buckley’s approach to practical politics . . ."
William F. Buckley Jr. may have been the most politically influential intellectual of the 20th century. In the mid-1950s, he set about to make conservatism a respectable alternative to liberalism by founding National Review. In the 1960s, he married conservative ideas to practical politics, first in the presidential campaign of Barry Goldwater in 1964, and later in his own run for mayor of New York one year after. He achieved the ultimate political success when his friend and philosophical pupil Ronald Reagan was elected president in 1980 and resoundingly reelected in 1984. Alvin Felzenberg’s A Man and His Presidents is a fascinating examination of Buckley’s approach to practical politics in the context of his strong but evolving philosophical views. Felzenberg was soon regularly reading Buckley’s syndicated column. He also read some of Buckley’s books, including The Unmaking of a Mayor, Up From Liberalism, Rumbles Left and Right, and later God and Man at Yale, and got “hooked” on Buckley’s new television show Firing Line. Buckley worshipped his father and hewed to those “eternal, time-tested, universal truths” in life, journalism, and politics, but not, Felzenberg shows, inflexibly. Throughout his career as intellectual conservatism’s leading public figure, Buckley repeatedly shaded his philosophical views when necessary to facilitate practical political goals. Felzenberg rightly attributes Buckley’s political flexibility to the influence of James Burnham, the brilliant Cold War strategist and analyst who Buckley called the dominant intellectual influence at National Review, and Whittaker Chambers, the tormented ex-Soviet espionage courier who Buckley befriended in the 1950s. Burnham and Chambers impressed upon their younger colleague “the importance of prioritizing goals, the need to cultivate public opinion for what one was proposing,” and in electoral politics the necessity of supporting the most right-leaning electable candidate. One way Buckley achieved this was by reading out of the conservative movement extremist elements such as the John Birch Society. Another way he accomplished this was to find areas of agreement among the different strands of conservatism—cultural conservatives, libertarians, and anti-communists. Finally, his own views changed, especially in the area of Civil Rights. 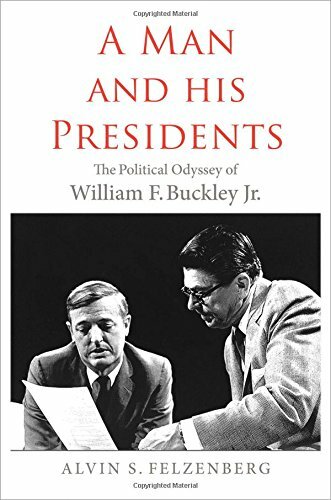 The book’s main focus is Buckley’s relationships with GOP presidents, especially Nixon, Reagan, and George H. W. Bush. Buckley was not close to Nixon, but supported him in 1968 and 1972, despite what Buckley believed was Nixon’s unnecessary abandonment of Taiwan as part of the opening to China, his pursuit of détente and arms control with the Soviet Union, and his liberal domestic policies. Nixon, for his part, was never a “movement” conservative, but he understood the political necessity of courting conservatives to maintain and expand his winning political coalition. Buckley accompanied Nixon to China, served briefly in his administration as a delegate to the UN General Assembly, and formed a close friendship with Henry Kissinger. This did not immunize the Nixon administration from strong criticism when Buckley believed its policies went against those “eternal, time-tested, universal truths” he held so dear. Ultimately, Buckley saw Reagan as a political leader who could win high office and implement the conservative agenda and conservative ideas that Buckley had been writing and talking about for decades. During Reagan’s presidency, Buckley acted as an “informal policy adviser and confidant,” frequently meeting and communicating with the president and Nancy Reagan. Reagan later called Buckley “the most influential journalist and intellectual in our era” and conservatism’s champion. Buckley had been friends with George H. W. Bush from their Yale days, but unlike with Reagan, the friendship with Bush was personal not philosophical. Much to Bush’s chagrin, Buckley and National Review failed to endorse Bush over the other GOP candidates in the 1988 primaries. Four years later, Buckley made it clear that he was philosophically closer to Jack Kemp and Pat Buchanan than to Bush, but in the general election he tepidly endorsed Bush over Bill Clinton and Ross Perot. Nevertheless, before he left office, George H. W. Bush awarded Buckley the Presidential Medal of Freedom. Buckley, of course, supported George W. Bush for president in 2000 and 2004, but Bush’s Wilsonian rhetoric and policies with respect to Iraq and Afghanistan struck Buckley as unwise, imprudent, and wasteful of American lives. “Nation-building,” often promoted by neoconservatives, was not to his liking. He often invoked the words of John Quincy Adams about not going abroad in search of monsters to destroy. It is a debate within conservatism that continues to this day.